Big. Bold. And show-stopping. Athena is created in glorious crescent sections, each one ornate – some with shields, some with triangles - all with a legion of gold “coins”. And at the bottom of the crescent-moon-shaped section, the necklace is finished with an octagonal shield, complete with clear crystal. 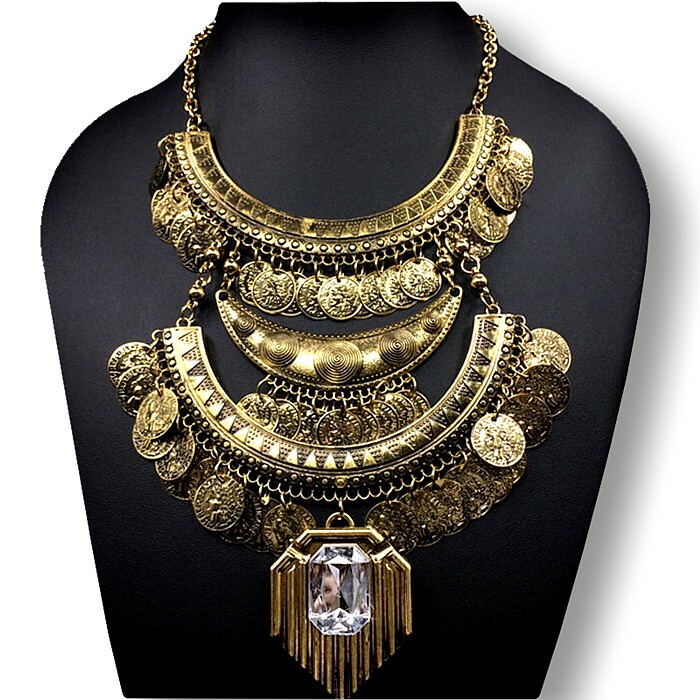 Reminiscent of the grandiose necklaces that high-born Roman ladies wore, today it ticks all the boxes for those who want something pretty dramatic to fill the void of a low-necked dress or top. Or sits neatly between the lapels of a jacket or tux. Also looks spectacular over a jumper or sweatshirt. Wear it high on the neck, or drop it down to suit your outfit.